“Up, down and all around.” That’s a phrase I often hear at clinics where people are talking about fertilizers for home gardeners. It’s an easy way for consumers to remember what the numbers mean on every package of fertilizer they buy. Of course, the numbers I am referring to represent the three primary elements found in every complete fertilizer — N for nitrogen, P for phosphorus, and K for potassium. By law, the relative values of these three nutrients must be listed on every fertilizer package. They are always listed in alphabetical order. It has always been an accepted fact that plants need these three nutrients. Lawn fertilizers have traditionally had a high first number (nitrogen), because the need for nitrogen is crucial to healthy-looking grass. Rose fertilizers usually have a high middle number (phosphorus), with the notion that additional phosphorus is a necessity to produce flowers. Bulb fertilizers are another example of a high phosphorus fertilizer. Then there are many fertilizers that have all the numbers the same, and these are usually referred to as general fertilizers. What a surprise it was to recently hear a soil scientist say that quite often in western Oregon, we need to add little or no phosphorus. This just did not seem right to me. Several months later at a different lecture with a different speaker, the same thing was repeated. I continued to wonder: How could this be that we do not need to add phosphorus? I thought of my own garden and how I always add a high phosphorus fertilizer when planting bulbs. Why do I do this? Well, because that is what I have always done. I decided to talk with some garden professionals in our area and get their views on adding phosphorus. First and foremost, I need to stress that all of the people who I talked with said that before adding any fertilizer it is imperative to get a reliable soil test. This will determine what elements, if any, are deficient. 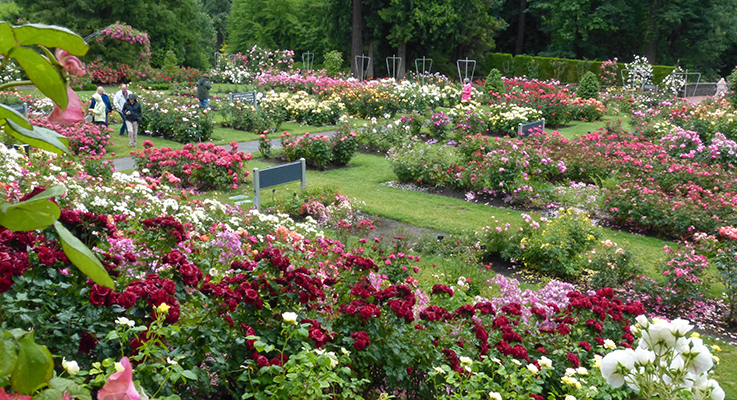 Last summer in a conversation with Harry Landers, botanic specialist and curator of the Washington Park International Rose Test Garden, I asked him about the phosphorus issue. He told me they have soil samples taken for testing every two years from various sections of the garden. The results have been astounding. The levels of phosphorus were close to being toxic, not only to the roses, but to other plants in the garden as well. Ten years ago, they stopped using any fertilizer with phosphorus in it. I can personally attest that after visiting the garden at least once every year in the summer, the roses are thriving. Nevertheless, I must admit I was still not convinced. My next call was to Dr. Linda Chalker-Scott, extension horticulturist and associate professor at the Puyallup Research and Extension Center. When she learned of my topic, her first words were, “Get a soil test.” She said if a home gardener gets a soil test, they will be “stunned” by the high level of phosphorus. When I asked about phosphorus being in the soil, but not in an available form to plants, she replied that often in a lab test phosphorus can seem to be unavailable, but in the soil, with roots and mycorrhizae, there is no such thing as phosphorus not being available. She further stated that in western Oregon and Washington she has never seen a phosphorus deficiency. While there is no actual restriction on fertilizers that homeowners can use, Anne stressed it is not just property owners along the lake who need to be aware of the phosphorus issue, but all property owners in the city. Two-thirds of the rainwater from the city drains into the lake. I think no matter where we live, the water from our landscape is going to carry pollutants into a lake, river or stream. But what exactly is the issue with excess phosphorus if it gets into a body of water? Jeff Ward, general manager of Lake Corporation, told me it has been an ongoing problem. Phosphorus tends to promote the growth of what we often call bad algae or blue-green algae. This is not actually algae, but cyanobacteria. It behaves like algae, creates colonies and floats to the top. It can make the water take on the appearance of blue-green paint, and the blooms can be toxic. In high concentrations, such blooms can lead to the closure of recreational waters. Even in low concentrations it makes the water look unfit for swimming. So let’s go back to phosphorus in fertilizer and whether it is actually needed. The consensus for our particular area (western Oregon and Washington) is that for most homeowners it is probably not necessary and should not be used because plants will thrive as well without it. I also learned it may be easier to talk about a fertilizer without phosphorus than actually finding one. I recently checked the shelves at several garden centers and all of their commercial fertilizers contained phosphorus. Dr. Linda Chalker-Scott suggested using fertilizer products such as feather meal, alfalfa meal and cottonseed meal, which have little or no phosphorus. I regularly use blood meal and that is another no-phosphorus fertilizer. I am certainly no exception to the adage that old habits are hard to change. It will be difficult for me not to add bone meal when I plant my bulbs, but I am going to try. Perhaps by spreading the word, we can dispel the myth that we need phosphorus in all of our fertilizers. The results can be better for our plants, our soil, our lakes and our overall environment. It just takes one gardener at a time.